Fern Snailham’s lightbulb moment to launch her own business came during the year she spent freelancing across the UK promoting new products and raising brand awareness. Still uncertain whether a university degree was what she wanted after finishing a childcare course at college, the 23-year-old took a year out promoting everything from supermarket products to cars. The work offered Fern the freedom and flexibility of being her own boss but she decided she needed the business qualifications to support those ambitions. 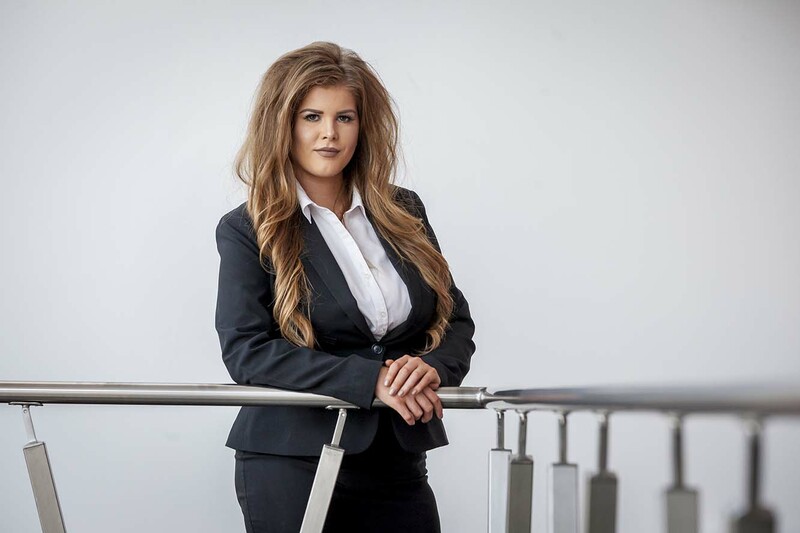 Fast forward three years later and within days of graduating with a first-class Business Management degree from Sunderland, Fern began setting up her very own promotional staffing agency– UNEEK Staffing. With the support of her university lecturers, Fern secured membership with the Enterprise Place, the University’s business support facility which gives her access to their co-working office space in Hope Street Xchange, the University’s new centre for enterprise and innovation. Fern is now in the process of building up an in-house database of hand-picked, reliable promotional staff, covering the UK. She plans to match personalities to brands to convey key messages, and deliver a positive, memorable brand experience. Dr Derek Watson, Senior Lecturer in the Faculty of Business, Law and Tourism, commented: “Our business programmes at the University of Sunderland are specifically designed to not only provide students with essential business insights and live commercial experiences but also to imbue them with a ‘can do attitude’ in order to seek a meaningful career path. “Fern is a natural entrepreneur but freely admits our degree programme has provided an essential business grounding to channel her creativeness into a successful business model. I will certainly be asking Fern to share her success with our student community”. Launched earlier this year, Hope Street Xchange was developed by the University with £4.9m investment support from the North East Local Enterprise Partnership’s (LEP’s) Local Growth Fund and £2.23 million from the European Regional Development Fund. Based on the City Campus it links the University to the region’s small business community by supporting fledgling start-ups and offering space for existing businesses to develop and grow. From here businesses can access students and graduates with the skills they need - through a range of options including placements, internships and knowledge transfer partnerships – as well as connecting them with the University’s world-leading research base, sector expertise and specialised hi-tech equipment. The centre was initiated by Sunderland Business Group, which aims to support entrepreneurship and increase the number of business start-ups with support from the North East LEP. Northern Powerhouse Minister Jake Berry, who recently toured the centre, said: “The Northern Powerhouse is about economic growth and creating jobs. When I visited the Hope Street Xchange this morning, I saw the University of Sunderland's commitment to fostering strong links with local businesses and helping their graduates launch their own start-ups. “This is an excellent example of businesses and a university working together to unlock the economic potential of the region." The North East Local Enterprise Partnership (LEP) is a public, private, and education sector partnership that covers Durham, Gateshead, Newcastle, Northumberland, North Tyneside, South Tyneside and Sunderland local authority areas. Its aim is to create 100,000 more jobs for the North East economy and to ensure that 70% of these jobs are better jobs. A better job is defined as being in the top three Standard Occupational Classification (SOC) categories, which are: managers and directors; professional occupations; and associate professional and technical occupations. Measuring this means LEP can demonstrate higher skilled and more productive roles in our economy. LEP develop and lead the delivery of the Strategic Economic Plan (SEP) which details how they will achieve this plan for growth for the North East. Could Brexit be bad news for British food safety?